2 per pack + a 1.2 oz. bottle of Buck Tarsal Scent! These glands are preserved with an odorless base so they will retain their strong natural scent odor and last all season. A great buck attractor shortly before and during the rut. Hang above or bury in natural or mock scrapes in a container with holes punched in it or use to lay a scent trail. 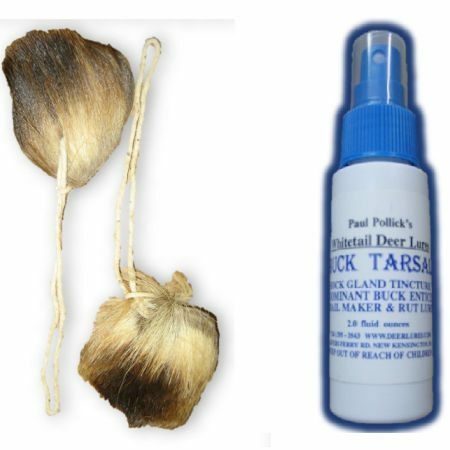 Re-scent with our liquid Buck Tarsal as needed. Handle with rubber gloves. Our tarsal glands have heavy butcher twine attached to create a natural scent drag or to hang in a shooting lane. Includes 1.2 oz. Spray Pump refresher bottle.